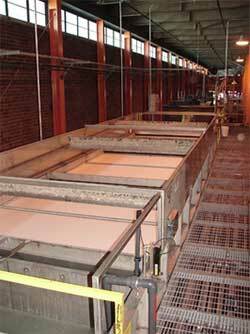 Aries designs and manufactures Dissolved Air Flotation (DAF) clarifiers. In addition to its standard Aries design Aries can manufacture DAF clarifiers to meet a customers’ unique process requirements or physical space constraints. 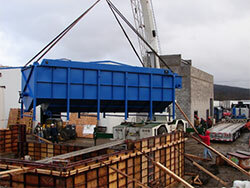 Aries constructs DAF clarifiers using epoxy coated mild steel, stainless steel or polyethylene. Dissolved Air Flotation (DAF) is an effective process used for the separation of suspended solids, oils & greases and other insoluble impurities from water. The Aries DAF systems use chemical pretreatment and micro air bubbles to separate contaminants from water. Pretreatment of wastewater lowers total suspended solids (TSS), oils and greases, biochemical oxygen demand (BOD) and metal concentrations. Some of the DAF clarified effluent is recirculated and supersaturated with air under high pressure. When this water is released into the DAF system under atmospheric conditions, micro-bubbles form and carry the suspended solids to the surface for removal. Listed below are a few of the applications in which a DAF system is efficient and cost effective. To determine the feasibility of an Aries DAF for your process or application, Aries can provide laboratory testing to determine removal efficiencies and flotation characteristics. 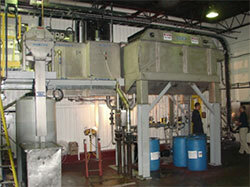 This laboratory work allows Aries to develop a cost effective chemical program can also be provided. Aries offers a full line of industrial wastewater treatment chemicals and DAF system components. Chemicals include coagulants, demulsifiers and flocculants. DAF system components include equalization tanks, oil-water separators, mixers, pH control, chemical feed & control, sludge thickening and de-watering.